As you are off out celebrating the festive season and enjoying the fireworks on Hogmanay, we wanted to share with you our highlights of 2015. Back in January, a momentous occasion happened, Mons Meg left the castle for the first time in 30 years to have her MOT. We raised our glasses in February as we launched our very own Edinburgh Castle beer in partnership with Caledonian Brewery. Treat yourself to a bottle available in our Portcullis Shop or enjoy with lunch in our Queen Anne Tearoom. In March we were looking up at the sky and hoping to catch a glimpse of the solar eclipse. It made a fantastic appearance over the castle. Catch the action here! To mark the anniversary of the Battle of Waterloo, two very rare Regimental Flags took pride of place in the Great Hall in April. Measuring 6ft x 6ft these delicate “colours” were taken into Battle in 1815. In May we caught up with our head chef Adrian Knibbs he and his team launched their Hog Roast ten. On offer was delicious roast meats, Yorkshire puddings and tempting sides. We all love a slice of cake – but what about a castle made out of cake? As we celebrate The Year of Food and Drink that is exactly what head chef Adrian Knibbs and his team created for Cake Fest in June. Along with other attractions in Edinburgh a skyline was created and very tasty it was too! What a month July was! We welcomed over 249,000 visitors over our drawbridge and with that over 7,700 Edinburgh Castle souvenir guide books were sold too! August was a busy month for our Redcoat Café and Queen Anne Tearoom where over 13,000 cakes and over 11,000 cups of coffee were served. Cobbles the bear arrived at the castle in September. He was named by one of our Facebook followers through our online competition. Only 1500 have been made so snap him up quickly in our Portcullis Shop. The new Governor of Edinburgh Castle was installed in October. This was symbolised by a presentation. Admire the beautiful Governor’s House the next time you visit. In November we launched our new Historic Scotland online shop. Browse online for great exclusive Edinburgh Castle gifts, our official guidebook and also our children’s book Discover Edinburgh Castle. And now we are in December – where has this year gone? Our Christmas Tree is taking pride of place in the Great Hall, our festive lunches have been devoured and we have been delighted with the presence of Mary Queen of Scots to tell us her festive plans. 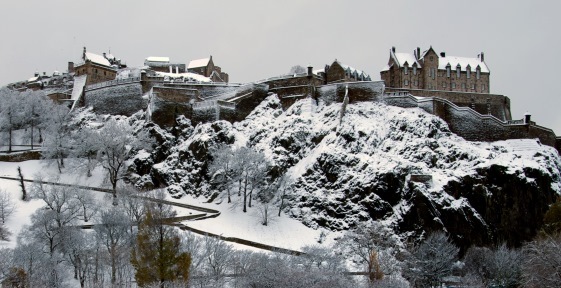 If that wasn’t enough our new Edinburgh Castle website has been launched – we hope you enjoy it! As we approach 2016 we celebrate The Year of Innovation Architecture and Design with our new exhibition A Tale of Two Cities which will be on display until 14th Feb.
Why not visit us on January 1? We are open from 11 am – 5pm. In the meantime, enjoy your Hogmanay!